I’ve never cared much about jewelry. So, when we exchanged simple gold bands on that lovely summer day in 1995 I was happy. Those circles of gold represented the promises we made to each other that day. And that is what made them valuable to me. In our second year of marriage for Valentine’s Day he gave me a diamond wedding set. Not because I longed for a diamond or he had a romantic notion to fulfill. I had lost my simple circle of gold and all of the promises it held and we needed to replace it. We were doing a little better financially at this time so I ended up with a diamond wedding set. I would love to say he “re-proposed” as he slipped the ring on my finger but he did neither. Come to think of it he never really proposed. It was a casual conversation that turned into a wedding one month later. About a year after I lost my gold band, a friend of mine found it in the couch we had given her. He took my circle of promises and slipped it on the pinky finger of his left hand and there it stayed. In the eighth year of our marriage I watched a documentary on “Blood Diamonds” and how they were used to support the wars going on in the Congo and Sierra Leone. I saw images of women and children with their hands chopped off to prevent them from mining these diamonds that are so often used as a status symbol. Sickened by these images and the reasons behind them I removed my diamonds and vowed never to wear them again. My husband supported and even applauded my social conscience. I was happy to place that gold circle, keeper of promises back on my finger. However, my husband really liked the symbolism of wearing my original wedding band on his pinky finger and I felt the sentiment behind that was sweet and meaningful. So we purchased a new, slightly fancier band; that I, once again; slipped on my own finger. Two years later as our 10th wedding anniversary approached I was very excited. It was a milestone that meant a lot to me. For several years I had wanted and been mentally designing a platinum band to mark this very special occasion. A couple of months prior to our anniversary both my husband and I went to a local jeweler and explained what I wanted. We sat there with paper and pencil trying to illustrate the vision I had been carrying around with me for so long. It was a simple design but for some reason I was having trouble getting it out. At one point my husband took the pencil from my hand and began to draw exactly what I was looking for; a simple platinum band with 10 starbursts engraved all the way around. Each starburst represented one year of marriage. On the inside of the ring I had him engrave the words, “The First 10”. My dream was to have a similar band created for every 10 years we were married. It was a romantic notion for sure but one that was meaningful to me. The ring was ready a week before our anniversary and I was excited to pick it up. It was exactly what I had envisioned and it felt even more special because we had both participated in the design. As much as I wanted to wear the ring—and he encouraged me to—I wanted to wait. We had plans to go away for our anniversary. Just a quick trip to Sun Mountain Lodge for the weekend but I was very excited. The biggest surprise came on the day we were officially married 10 years. It was early afternoon and we were sharing a bath and glass of wine in the Jacuzzi tub. He reached out, picked up my left hand and held it gently. He began to share how much he loved me and how happy he was to be married to me. He said how proud he was of my decision to give up wearing diamonds and the reasons behind it. As he continued to speak he began to slip the anniversary band off the finger of my left hand where I had happily placed it just that morning, replacing it with a beautiful princess cut diamond. I opened my mouth to protest but he asked me to hear him out. He told me the story of how he had been working with the same jeweler for months to find what was called a Polar Bear Diamond. It’s a diamond mined in Canada and is considered “bloodless” or “Conflict Free”. He went on to say how much it meant to him to put this diamond on my finger because I, more than anyone, deserved it. Needless to say I was crying at this point. It was such a thoughtful and meaningful gesture. It meant the world to me. I felt as if the promises held in the gold band on his pinky finger could be shared, if not transferred to this ring. In 2006, for Christmas he gave me a beautiful ring that held three diamonds (all conflict free) to represent the past, present and future. Again, it was thoughtful, meaningful and a surprise. Christmas 2007 it was a diamond journey necklace. It was around that time we decided not to exchange gifts anymore. We generally bought ourselves what we wanted or needed and decided to remove the “pressure” of having to come up with gift ideas. The first year of no gifts was tough for me but I got used to it. In 2011 we spent our last Christmas together as a married couple (blissfully unaware that in five short months it would all be over). It was also the year that he surprised me with the most meaningful and thoughtful gesture I had ever received from him. As I mentioned, we had stopped exchanging gifts several years prior so I wasn’t expecting anything which explains why I was confused when two gifts were placed in my lap. They appeared to be professionally wrapped in white glossy paper with red ribbon and bows (the colors of our Christmas decorations) but they weren’t. He had wrapped them himself. I looked at the gifts and then at him and whispered, “You got me a present?” my voice filled with emotion. He just looked at me without responding. “You got me a present.” I stated my voice filled with awe. “I can’t believe you got me a present.” I whispered as the tears began to flow. Upon opening the first gift I immediately recognized the box as being from Swarovski and rightfully guessed it was the crystal horses I had been raving about for weeks. “Are these what I think they are?” I could feel the heat on my cheeks and taste the salt of my tears as they flowed faster and harder. I didn’t even finish opening them before I reached over to hug and hold him. “Oh my God, I can’t believe you did this! When? How?” The questions flowed as the shock wore off and joy took over. He encouraged me to stop talking and continue opening my presents. After spending several minutes admiring my beautiful horses I gently placed them back in the box. I began to slowly, methodically unwrap the second present. I wanted to savor every moment. However, as soon as I saw the distinct shade of Tiffany blue I tore into it. Inside of the box was a diamond infinity ring set in platinum. That was the last piece of jewelry he gave me. Our marriage ended five months later. That was 15 months ago. Yesterday I decided I was ready to let go of the past and begin moving forward. I took the jewelry that represented those thoughtful and meaningful moments of our marriage and sold them to a wholesaler. Apparently those moments aren’t as valuable now as when they happened since I received but a fraction of what they cost… monetarily anyway. 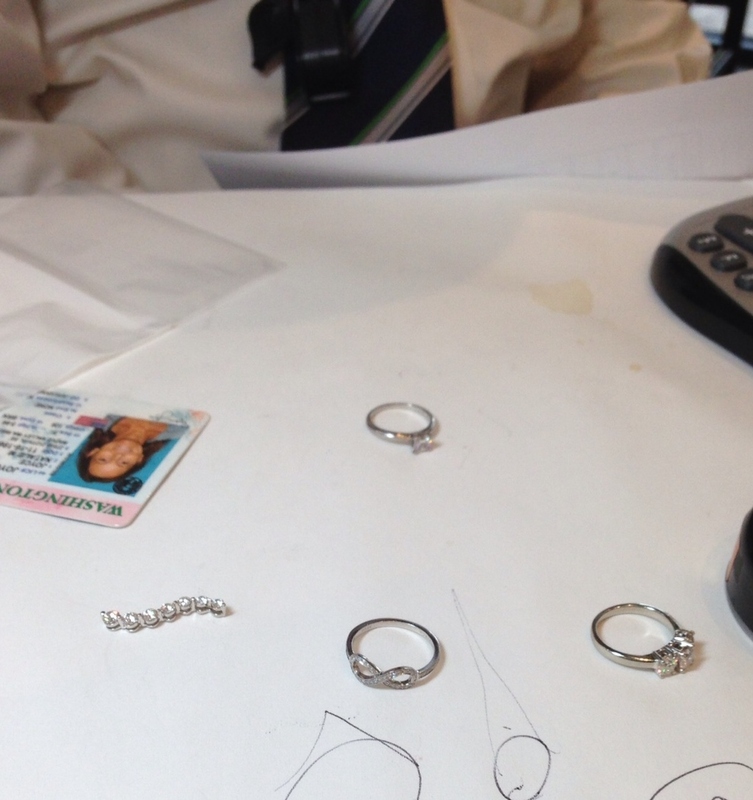 I sat silently as the jeweler evaluated each piece. Remembering… Tears came to my eyes and my voice shook as he asked questions. He kept apologizing to me. Telling me how sorry he was that my marriage had ended. Asking me if I was sure I wanted to do this. All sentiments I would’ve liked my ex-husband to have expressed to me before he made his decision to end the marriage. “Yes. I’m sure.” I said. “It’s time to move on.” My spirit grew stronger as I spoke these words and I am happy to say they are the truth. I felt lighter when I walked out of there. As I thought about what to do with the money I knew I would pay some bills. I also felt the need to do something meaningful and thoughtful with the proceeds. To honor the spirit in which they were given and received. Immediately an idea came to me. One I followed through on when I got home. I wrote a check to my daughter and son-in-law. They have been trying to conceive for the last two years without success. We recently found out they would not be able to have a child without help. The money will be used to help pay for the first fertility treatment they will be doing in September. The intent is that each one of those diamonds will be forever represented and the meaning behind hold true… hopefully, through the success of this procedure. If diamonds are truly meant to be forever then they never really belonged to me. They would have eventually been passed on, creating new memories of meaningful and thoughtful gestures for someone else. This entry was posted in Life After Divorce, Surviving Divorce and tagged Diamonds, Divorce, Infertility, IUI, life after divorce, Reflection, Relationships. Bookmark the permalink.